This summer we went on a Russian trip and besides for Moscow we could not skip the second largest city in Russia. 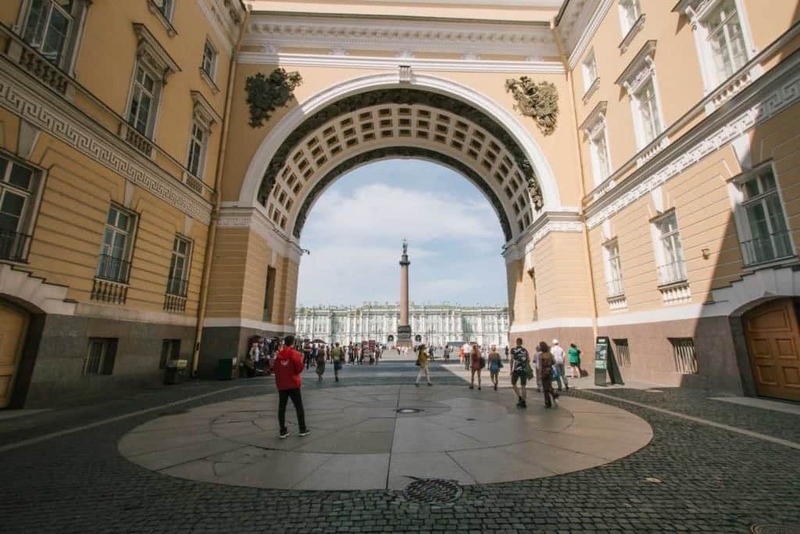 Saint Petersburg, a city known for its cultural richness made a great impression on us. Thanks to many pleasant encounters it is safe to say that Saint Petersburg has got a young, active, artistic and eager to learn coffee scene. 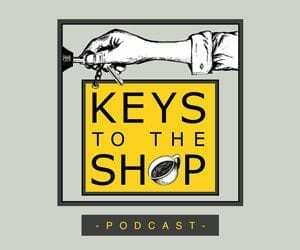 People of the local coffee community help each other and try to learn as much as possible from one another. It is also a cultural thing to drink coffee all day long! We witnessed it at the end of our 5-day stay, sitting on a coffee bar at Pitcher. It was 8pm and the local coffee joint was just entering its evening rush hour. It was then the time for the people of Saint Petersburg to socialise. 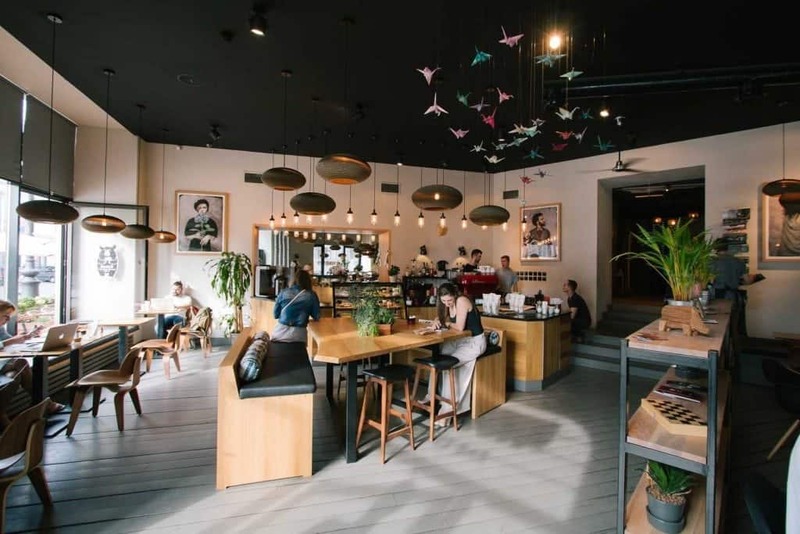 Let us take you on a tour of ten cafes in Saint Petersburg. Two streets from Moskovsky Vokzal, the main train station bringing people from Moscow, we found the first cafe to explore Pitcher Coffee Bar. 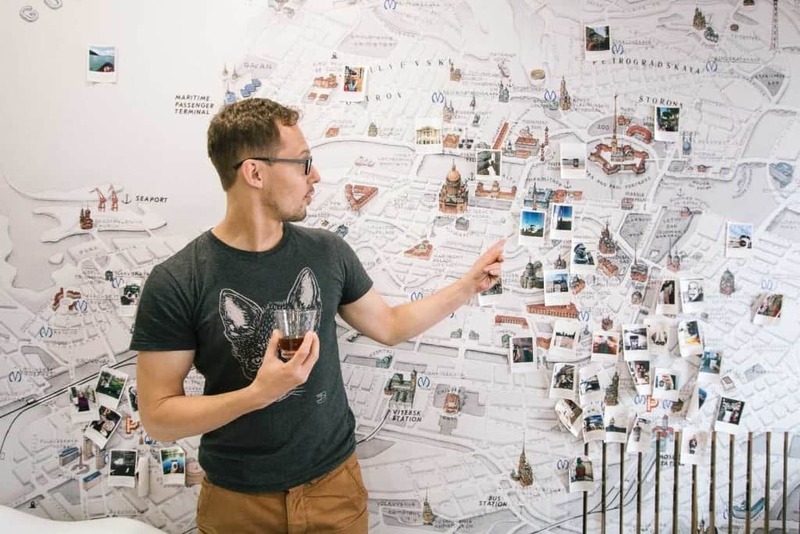 Through a flower shop we entered the cafe welcoming us with a large map of Saint Petersburg drawn on a wall. Instagram photos with Pitcher’s take away cups are glued to different spots on this mural map painting. “We have had a contest on Instagram so people share photos with our cups,” says Duma, a young barista behind the bar. “We have collected over 2.000 photos, and every week we choose the best one. 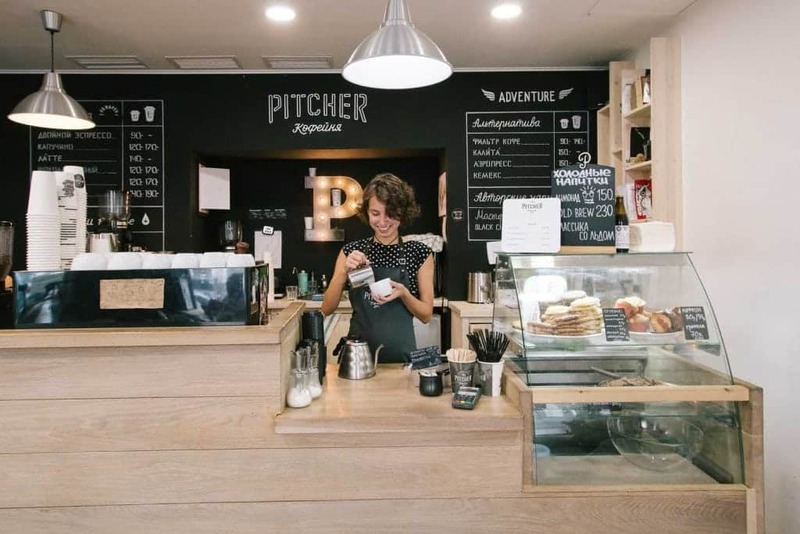 The author then becomes a member of Pitcher’s Club,” explains Duma the interesting initiative that encourages loyal customers to express their preference of coffee. 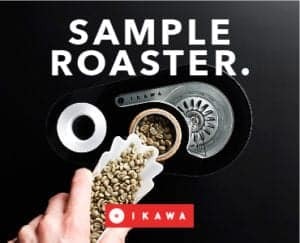 Coffee is primarily supplied by Moscow’s Coffee Owl, we could taste a naturally processed Colombian coffee from Finca San Pascual for both espresso and filter coffee. We opted for a Kalita Wave brew, one of the three brew methods on offer. It was prepared by Masha, a member of a young barista team that creates a very energetic vibe for their customers. Looking around the cafe, we discovered beautiful wooden Pitcher badges created by a local business called Waf Waf. A minute later, we met Daria Msoeva, their talented photographer and designer who later gave us our own, custom made ECT budges. Thank you! 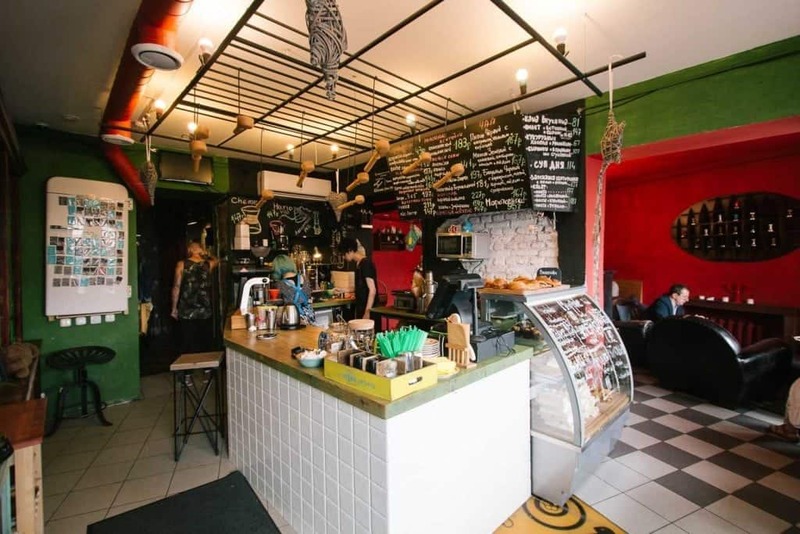 Coffee in the Kitchen (Кофе На Кухние) is situated further into the city centre, at Fontanki street. 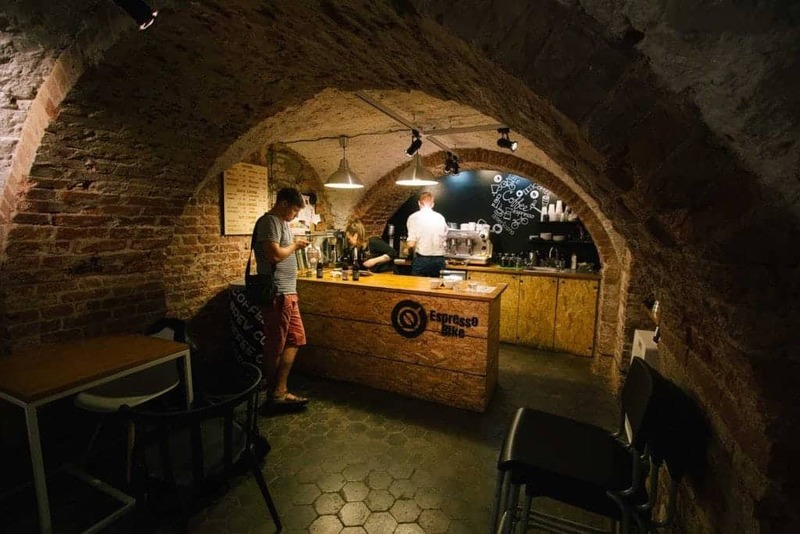 Pioneers of the speciality coffee in SPB now roast their own coffee and run 4 cafes around the city. 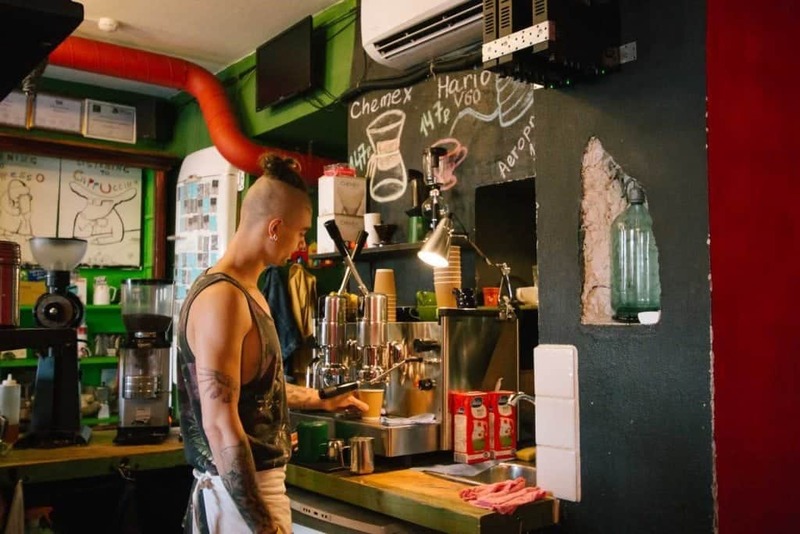 Although you may be aware of the cafe’s worn-out interior – it has been accommodating people for a while after all, it has not lost any of its comfortness. Order a cappuccino and a piece of cake from their wide selection, and enjoy the view on the Fontanki river. You might be even intrigued to take a boat trip. It is a two group Lever espresso machine that takes care of espresso based drinks here, but we tasted an Ethiopian Nano Challo prepared on a V60. Next to our preferred method there were also Chemex and Aeropress on offer. 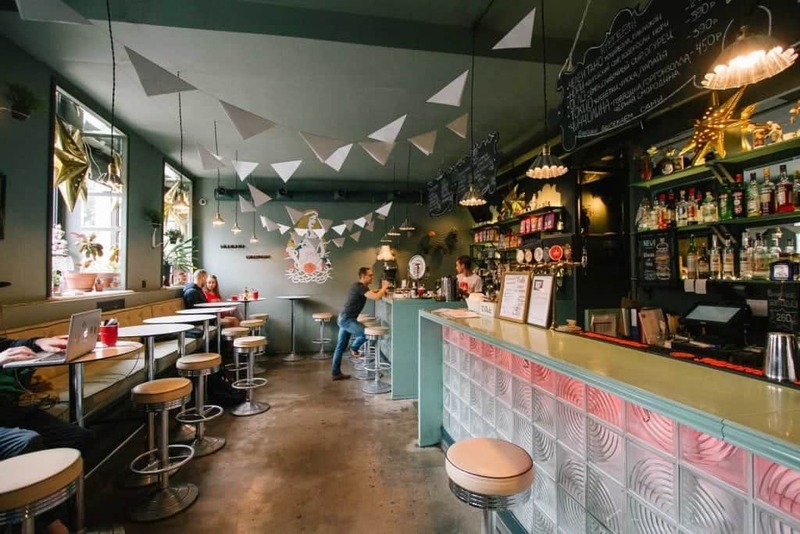 The brew was served in green Steelite cups matching the colour scheme of the cafe – with red wall paint,black wooden tables and the green bar. 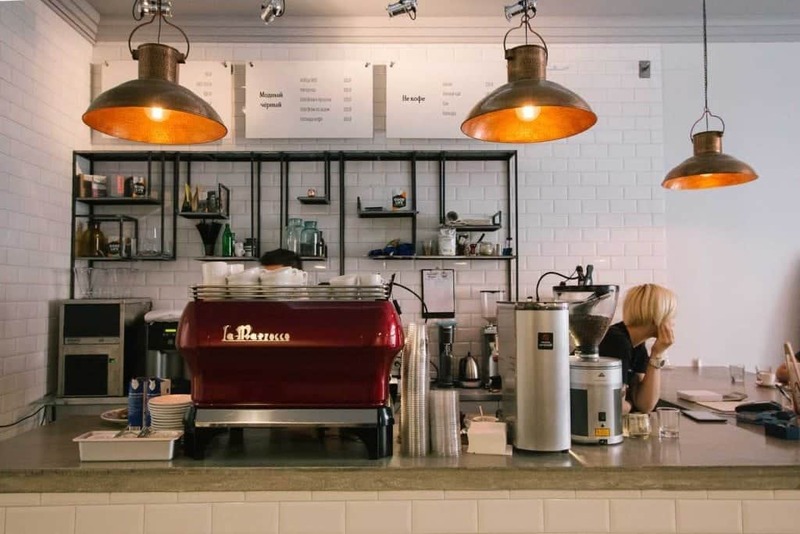 The decor of the cafe is finished with a piano, wooden portafilters hanging from the ceiling, tampers glued onto the walls, portafilters instead of handles and many certificates indicating you are in a barista’s wonderland. Continuing along Fontanki river you will come to Dreamers. 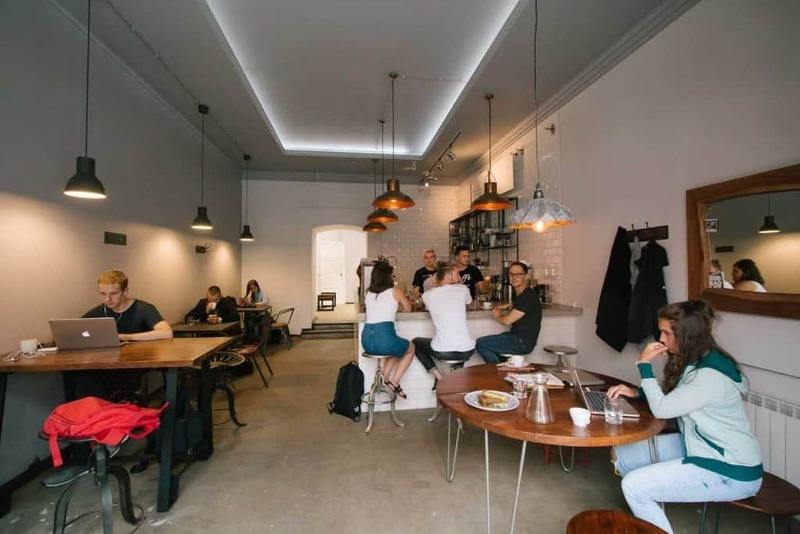 A modern restaurant with an open coffee bar was established in 2015 by Ludmila Ivanova, the person behind probably the first speciality coffee shop in the city, Coffee Station. 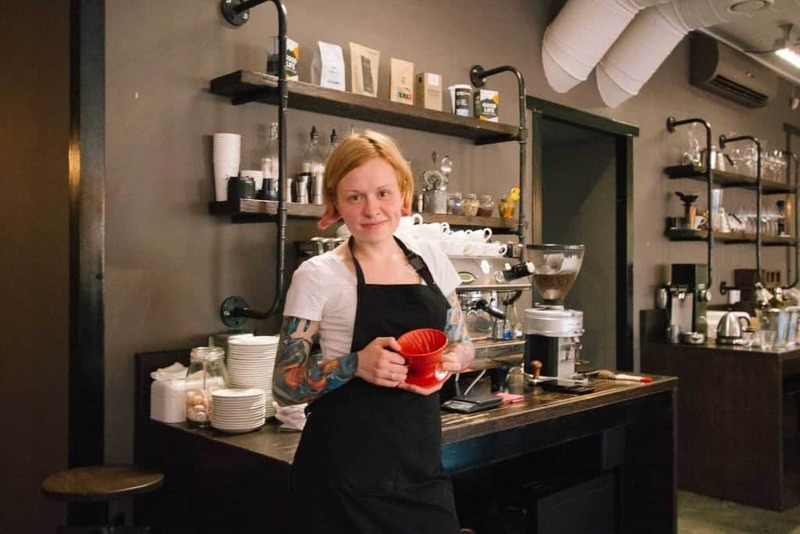 Our barista at Dreamers was Natalia Obruch, whose journey to Saint Petersburg led via Moscow (Double B) and Ekaterinburg before she settled in Saint Petersburg. She made us an espresso from an El Salvadorian washed coffee. It was roasted by Coffee in the Kitchen, which actually resides just next door. La Marzocco PB5 and Mahlkoenig K30 were machines sitting on the espresso bar, with the brew bar equipped with a Ditting grinder and V60 or Aeropress brew methods. Natalia came 2nd in Russian Coffee in Good Spirit 2016 which made us eager to try some of her coffee cocktails. Unfortunately, an alcohol license was not yet issued for the cafe. Hopefully next time but already at Pif Pif where did Natalia moved recently. On the other side of Fontanki Street, crossing the main boulevard of Nevsky Prospect you will find a cafe with a character. 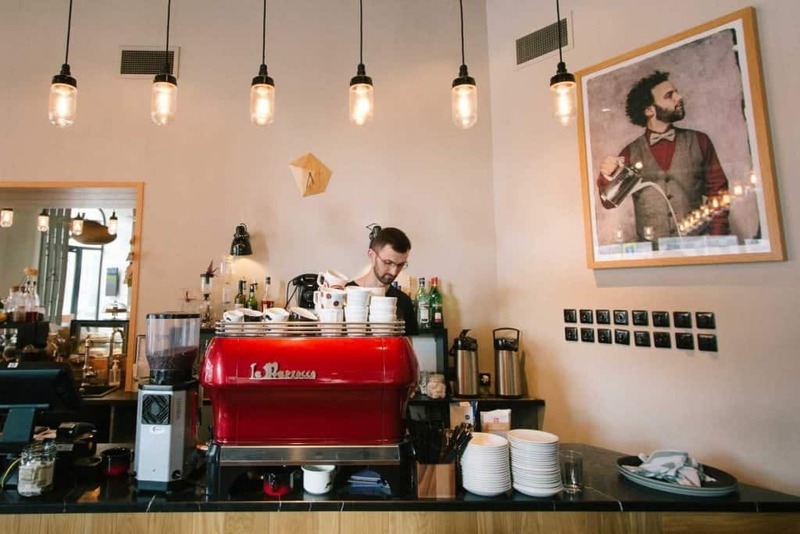 Character Coffee opened in 2014 and thanks to its logo – the face of the owner’s beagle you will recognise it easily. Chelsea the beagle is a true character and as such was an inspiration to define the style of the cafe. The coffee served here is sourced by the cafe themselves, and it is roasted by Vasil, a roaster at North West Roasting Company. 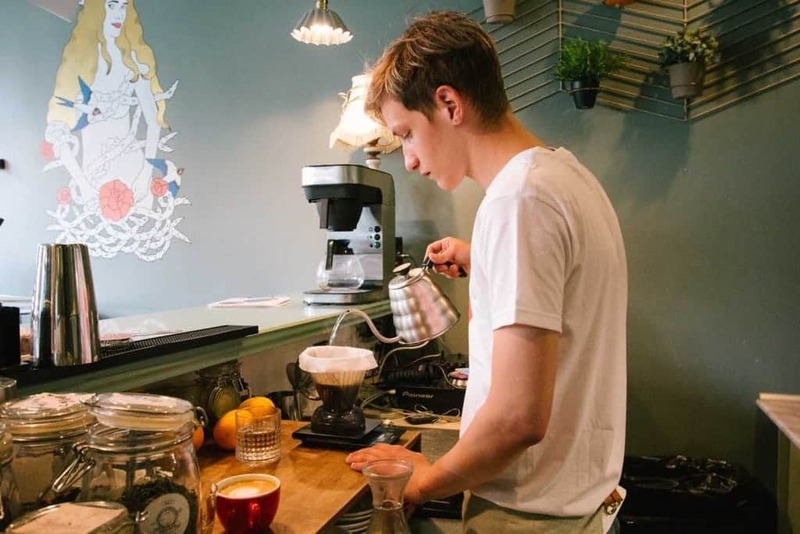 “We have two coffees for espresso, one suited for milky drinks and one for espresso without additives,” explains barista Artim their aim to serve a different origin for straight espressos. Accordingly, one Mythos grinder is of white colour and the other one is black. Both sit next to NS Aurelia espresso machine. 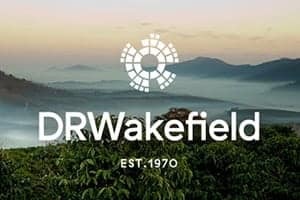 Two filter coffees from Rwanda and Colombia were supplied by guest roasters: Has Bean, Public Coffee Roasters and Harsham. For this season, Character Coffee also prepare and serve Nitro coffee. If you don’t fancy a coffee drink, try tea or hot chocolate, also served a special ingredient – “with a character”! 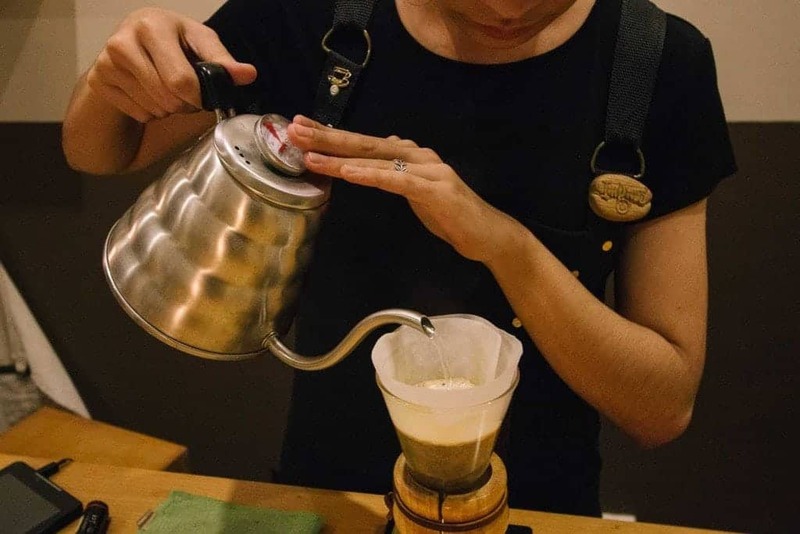 “Welcome to the Coffee Owl Roasters” says the coffee menu at Pif Paf (Пиф Паф). Pif Paf is a bar known for its food service, while Coffee Owl, Moscow-based specialty coffee roastery takes care of the coffee menu here. 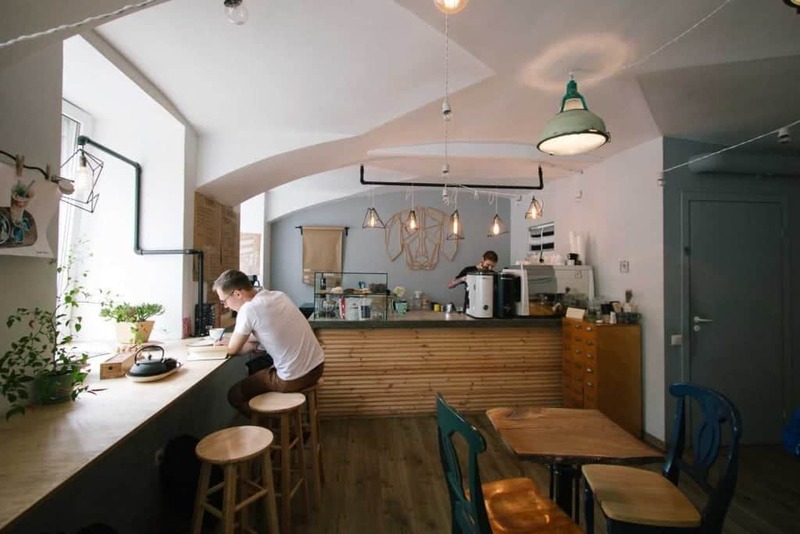 The roastery supplies coffee to all around Russia, but this cafe in SPB is their only retail store to be selling their beans. 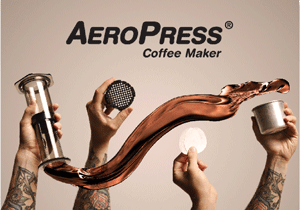 We skipped espresso in order to discover their range of single origin brews on filter. We decided to try a naturally processed Brazilian coffee which advertised notes of tropical fruit, lemon pie and creamy body. Slavek prepared the brew using a clever dripper. He then insisted we tried his favourite drink, Affogato. We could not say no. Before leaving we discussed the advantages of a combined business. Apparently, the bar allows him to often prepare Irish Coffee, or a drink called New Americano, a mix of brewed coffee and wine. We have to try it next time! Just around the corner from Pif Paf at the Kazanskaya Street Coffee 22 resides at the building of the same house number. If you saved a space for a lunch you did the right thing. This design cafe serves a selection of daily menus. Listen to some electronic music while waiting for your food. There are DJs playing three times a week, while the coffee is on offer constantly. The minute you enter the cafe you recognise the Kees van der Westen Duette. Its design is nicely complemented by the concrete bar showcasing the logo of the cafe and a vintage “shop cabinet”. We tasted an espresso from El Salvador roasted by Coffee Owl. 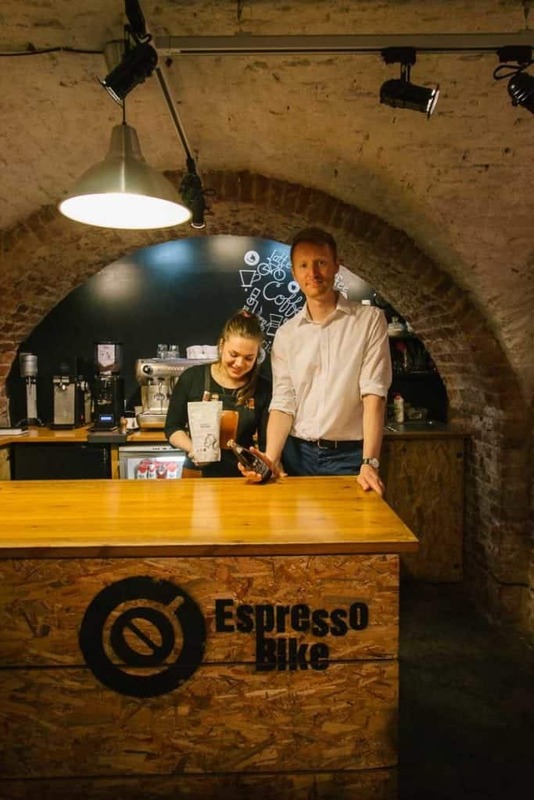 Espresso Bike firstly opened in 2013 as an actual “espresso bike”, selling coffee in front of a shopping mall. 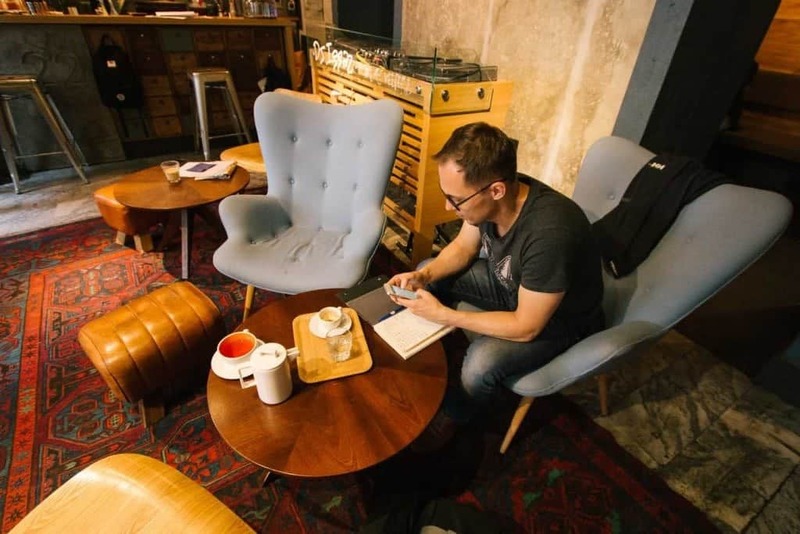 It is run by Dima Pavlenko, and at that time it was only him and his wife running the cafe. A year later, when Dima tried a single origin coffee from Kenya for the first time, he fell in love. 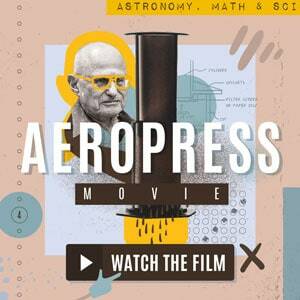 His eye opening coffee was roasted by Sweet Beans, since then he was ready for the next step. They moved their bike business to an actual cafe space in the Freedom Palace. What used to be an abandoned place is now a shared space for many creative businesses and galleries. In the basement of the palace there was an extra space. Espresso Bike took the opportunity this summer and started a reconstruction which will enlarge their cafe three times. Lisa, a barista at Espresso Bike brewed us her favourite Kenyan coffee from Sweet Beans that Dima helps to distribute in SPB area. 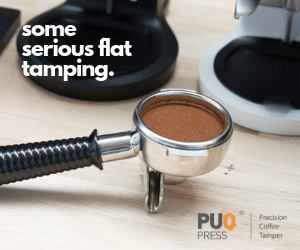 A Futurmat espresso machine, an Anfim grinder for espresso and a Ditting grinder for filter coffee are placed on the bar. 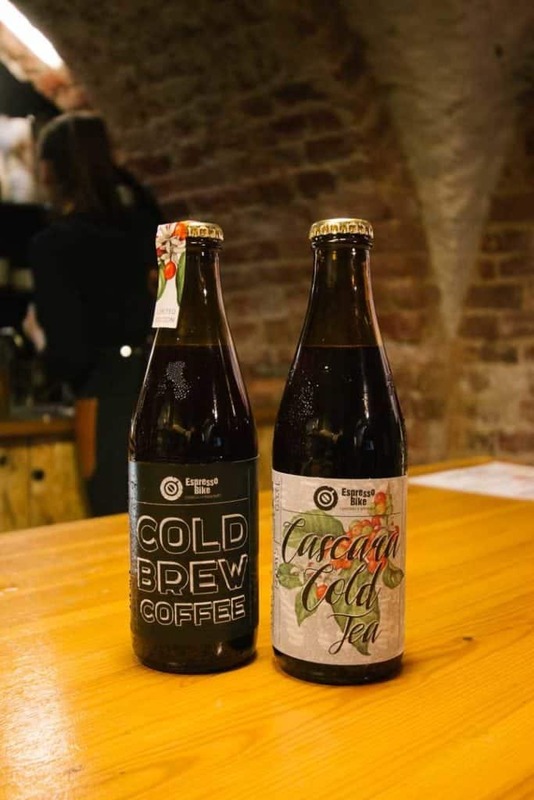 Starting this summer, Espresso Bike is not only selling their cold brew in the cafe, they also bottle it for retail sales. Some of their regular retail customers from Oh My Tea cafe and Микрокофейня “ТЧК” cafe just came by to pick up another batch of bottled cold brew for their cafes. 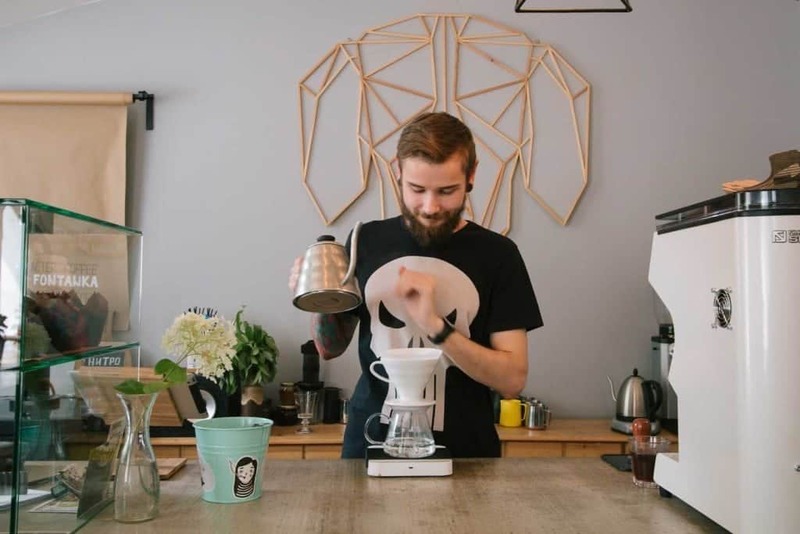 Mad Espresso Team is a brand new project of baristas and roasters of North-West Coffee Company. They opened in April 2016 and as they put it: “everything is in progress.” That means they are still establishing the perfect way to do everything in the shop. 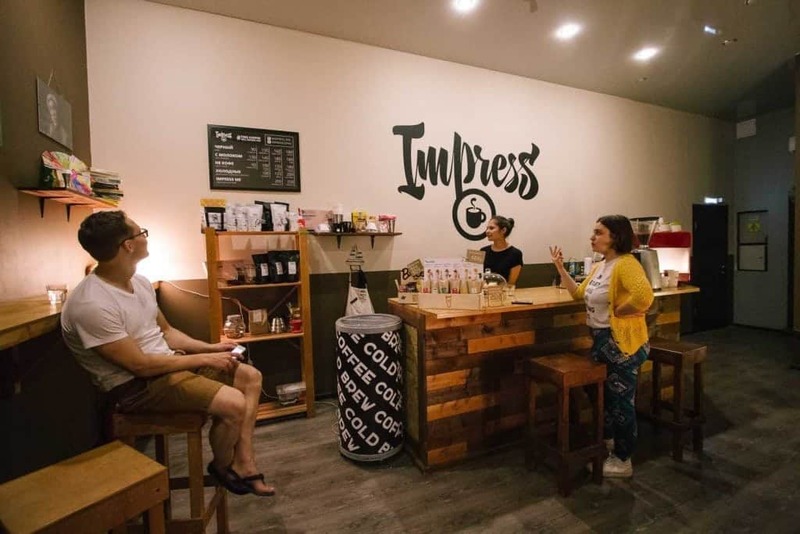 “When preparing for a barista competition it can get pretty intense and we are like mad scientists,” explains barista Irina Sharipova the idea behind the name. 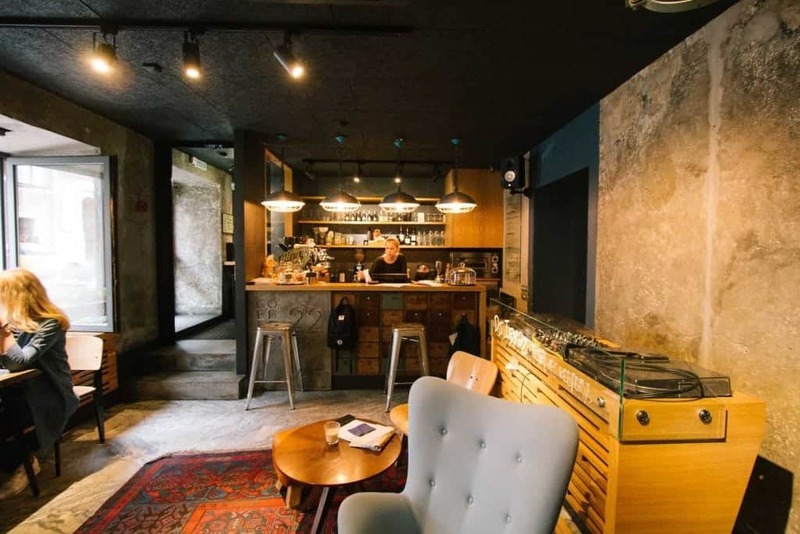 This beautifully designed cafe is located at Sovetskaya Street, just a minute from Nevsky Prospect boulevard. 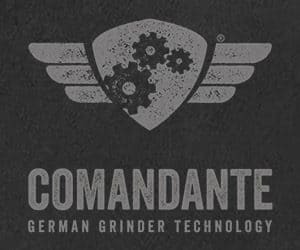 Coffee is roasted by the co-owner himself, Vasiliy Ladygin, on a 2,5kg Diedrich roasting machine. On a spacious concrete coffee bar you will find a 2 group La Marzocco FB80, VA Mythos and Mahlkoenig K30 grinders. Their menu also includes cold drip coffee that is perfect for hot summers. Coffee is the main focus for Mad Espresso Team, and as such water is an important part of their set-up. Barista Valentine Podolskiy showed us barrels with water that they buy and use for all their brewing. “Public water in SPB is not stable so we decided to use this water,” he explains. The day of our departure the kitchen started serving food and we cannot wait to be back for that! It is always good to hear about new businesses combining food and coffee. Owners Andrew and Nick set the expectations high when they called their cafe Impress. After several years of running coffee bars during restaurant days, opening a “real” cafe was the next step that made sense. They had so much passion for coffee. They found the right location in a courtyard of an old house, in the urban area near the city centre. Andrew and Nick work with Moscow’s Chelovek i Parohod, but during our visit they had guest filter coffee from Craft Coffee to try. 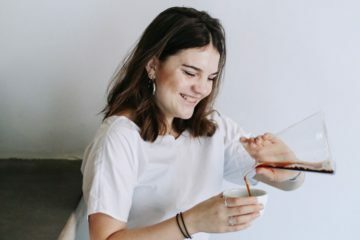 Karina, a passionate young barista who started just two weeks earlier recommended us to try their Rwandan coffee on Chemex and Ethiopian coffee roasted by Sweet Bean in Krasnodar on V60. Before we left we took the last piece of homemade cheesecake baked by Nick. 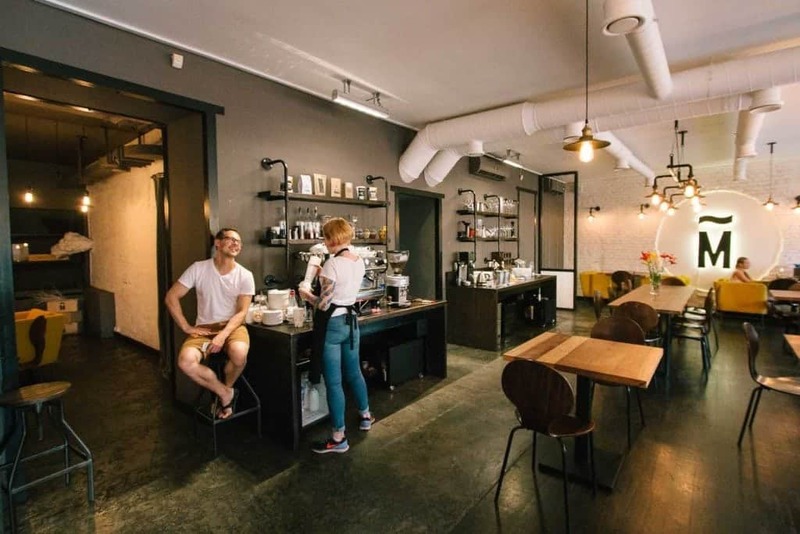 As close to the city centre of Saint Petersburg as possible Bonch offers quality coffee and snacks for variety of customers. 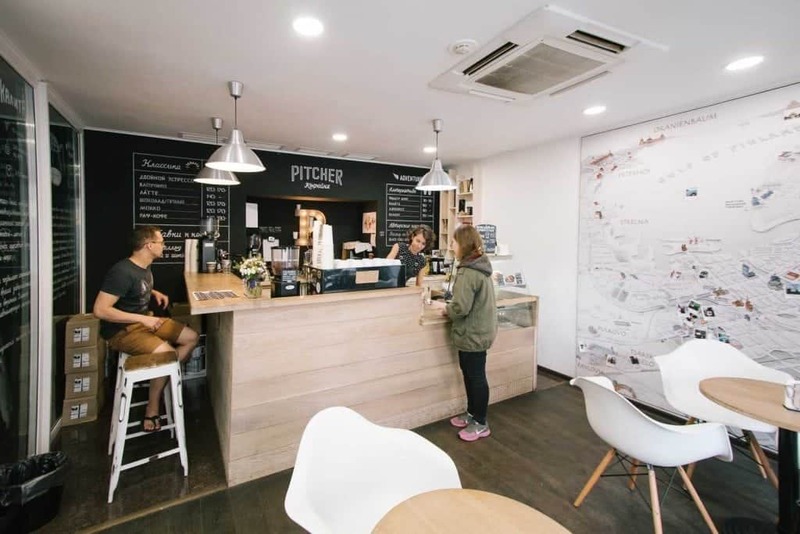 Ranging from tourists to local students or freelancers, you can find them at Bonch, sitting at wooden desks, enjoying the welcoming vibe of the cafe. The cafe is located at a corner of a building just 5 minutes walk from Palace Square and the State Hermitage Museum. It was opened 2 years ago, in July 2014. They serve coffee roasted by the local North West Roasting Company. 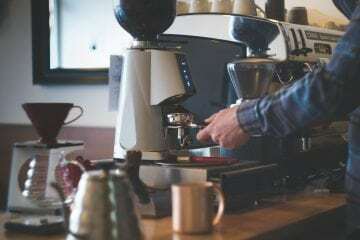 Their espresso drinks are prepared on a red 2 group La Marzocco PB5, filter coffees are prepared in a batch brew, or hand brewed using a V60 or an Aeropress. 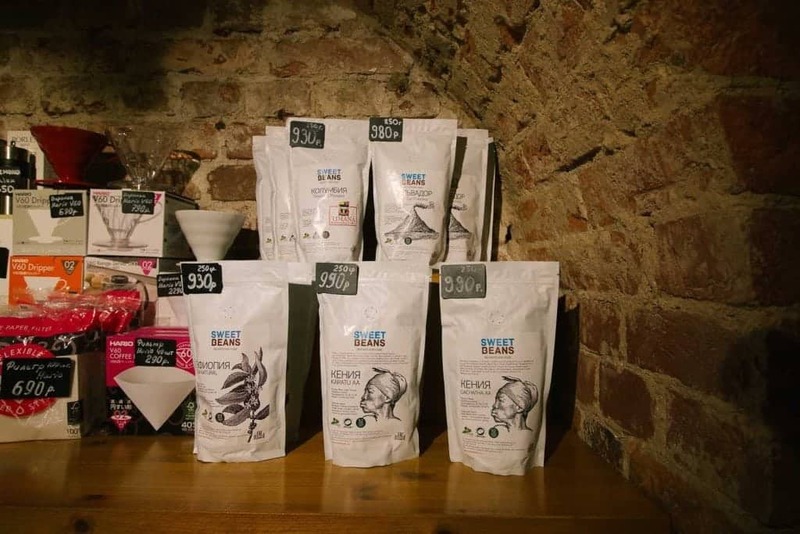 Is Ankara The Ugly Duckling Of The Turkish Specialty Coffee Scene?